How can we understand the relationship between religious devotion and cultural patrimony? How does the performance and documenting of sacred rituals intersect with the construction of collective memory? These questions are explored in a new volume entitled Linguaggi della devozione. 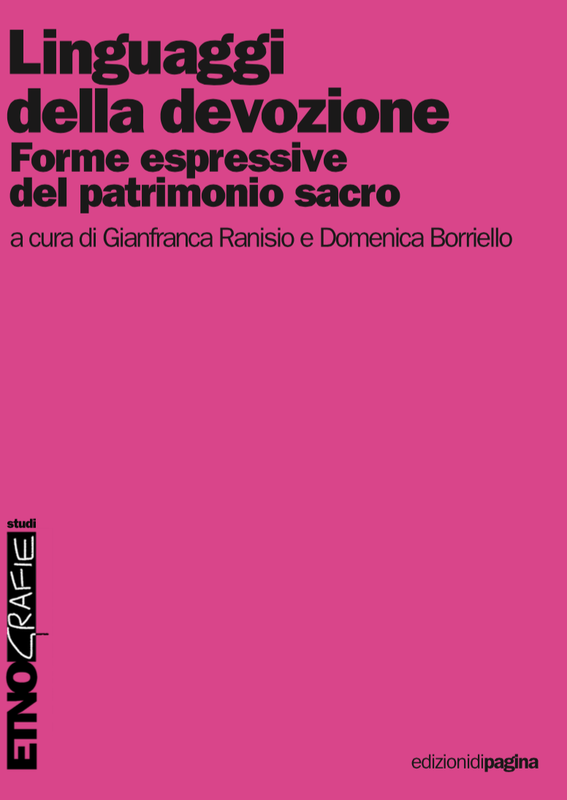 Forme espressive del patrimonio sacro [‘Languages of Devotion: Expressive Forms of Sacred Patrimony’ ] edited by Domenica Borriello and Gianfranca Ranisio. The chapters in the book focus primarily on rituals taking place around the South Italian region of Campania, and much emphasis is placed on the multiplicity of expressive ritual ‘languages’ – which range from the smells and colours of the Infiorata (colourful mosaic pavements made of flowers and depicting holy themes) to the way in which social media is being utilised to create new sorts of devotional space (including the Facebook group for the relatively new cult of the Madonna of Zaro on Ischia). Scholars working on votive offerings will be particularly interested in Domenica Borriello’s chapter about the Campanian votive edicule (small ‘shrines’ or ‘altars’) which are decorated with painted maiolica tiles. These edicule are primarily found in urban locations – on streets, by the doors of buildings, or on balconies outside apartments – although they do also appear in rural places. A small number of edicole have doors and thus become almost like tiny chapels, but most are structures of small to middling size which are set into walls, resembling small outdoor altars. The photograph at the top of this page shows an edicola dedicated to Sant’Antonino, who is worshipped in the town of Sorrento and at other places along that stretch of coast, including the tiny commune of Arola where this example is found. Such images demonstrate a strong local devotion to the person depicted on the tiles, and often get decorated with flowers, lights or lace doilies. Linguaggio della devozione is published by Edizioni di Pagina. With thanks to Domenica Borriello for sending news of this publication and the photograph of the Sant’Antonino edicola. ← Love Locks: Votive deposits or destructive vandalism?